I received a voice message earlier today from a woman I'd never met, who she said the magic words "Wild Care", (a non-profit wildlife care facility in nearby Eastham that treats ill, injured and orphaned wildlife for release) so I was intrigued. 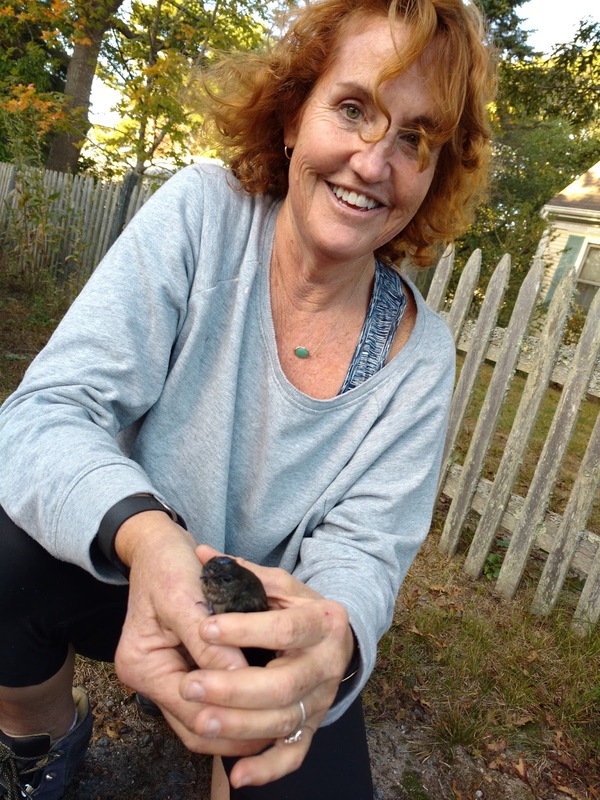 Her name was Jane; she explained she'd been looking for swallows throughout the Cape in order to successfully release a rehabilitated Chimney Swift. This particular bird came to them from another wildlife rehab center. 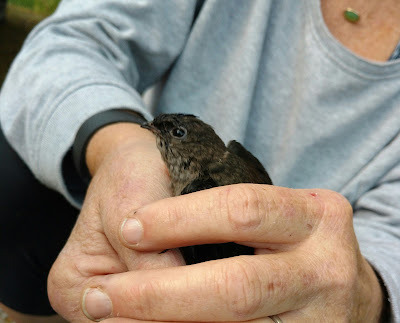 His treatment took a longer time than the other Chimney Swift patients who'd been recently released as a flock by Wild Care. Everyone who had cared for him was very concerned about his ability to thrive once released being on his own, which he really shouldn't be this time of year. Tree Swallows are flocking now, fattening up for their long long migration to warmer areas, like Florida, Baja California and Central America... though Chimney Swifts, all 5 or so inches of their little selves, typically migrate to Northwest areas of South America (primarily Peru, Ecuador, Colombia & parts of Brazil) Chimney Swifts have already left on migration. They couldn't hold back the possible success of the many, for the needs of the one. Jane was informed though, that if she could connect this bird with a flock of Tree Swallows, he would have a greater chance of survival while flocking with them on their migration. The trouble is that most of the local populations of Tree Swallows have just recently left on migration. Finding a local flock would be nearly impossible. As the Magic 8-Ball predict sometimes: OUTLOOK NOT SO GOOD. Here is the CRAZY part. I returned Jane's call while walking my dog and leaving her a message... as I approached my own house just minutes later, I couldn't believe MY EYES. 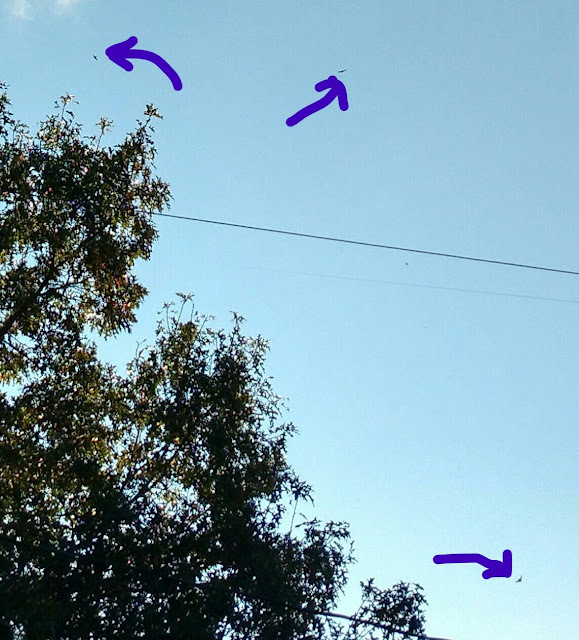 There they were, about 10-15 Tree Swallows, performing their aerial acrobatics while fueling up on the insects they're instinctively designed to hunt. The very species of bird Jane and this little swift were in need of, were OVER MY HOUSE. Jane called back within minutes. I told her about the swallows. I gave her my address. Twenty minutes later, I was meeting and making a new friend, along with getting a peek at a Chimney Swift, UP CLOSE! The precious little swift was ready to go! I took a few pictures before he flew off, to meet his new flock, heading to warmer areas... in search of buggy food along the way. 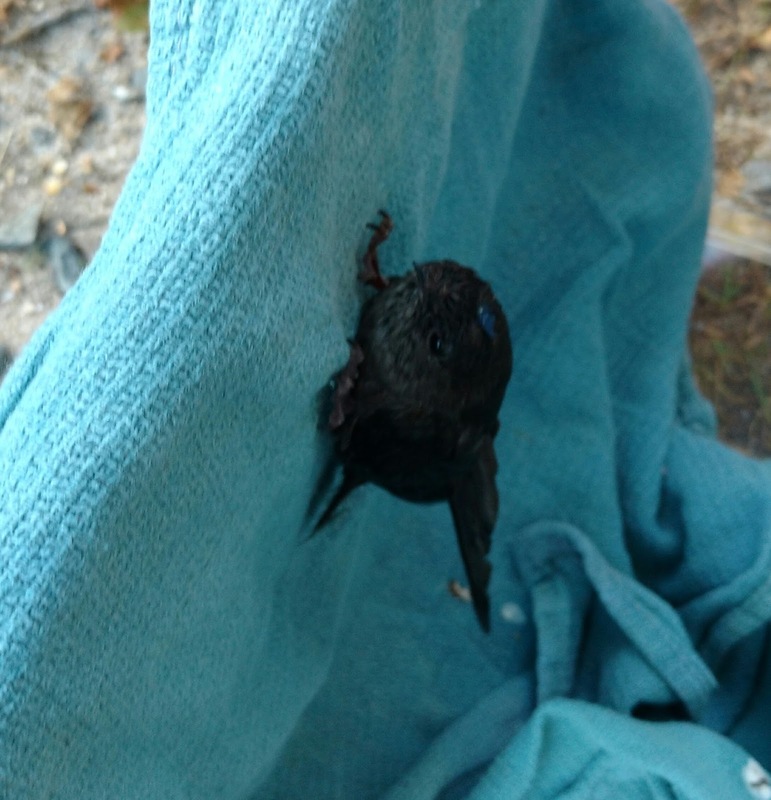 I was honored to be a small part in the success of this little life who was cared for by so many, giving back the gift of his healed and able-to-fly-again body, thanks to the patience, dedication and kindness from the folks at Wild Care, Jane in particular. It's Jane's birthday tomorrow! Happy Birthday Jane! Thank you little Chimney Swift. I'm so glad there's a nearly full moon to guide you. Chimney Swift... ready to FLY! Jane - I'm SO glad you called and that we met today! 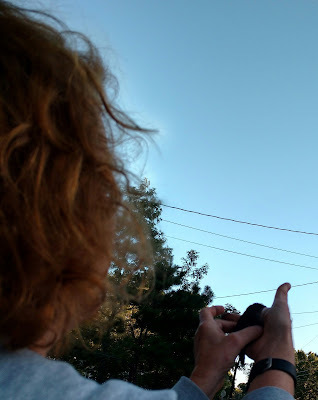 I'm grateful that compassion and empathy are alive and well on Cape Cod, especially with regard to tiny, amazing, feathery packages.